At Ikigai, we believe we are obligated to be shepherds of this technology -- to help the world better understand the powerful potential of distributed ledger technology (DLT) and crypto assets. We strive to fund, cultivate, and build DLT projects that will affect positive societal change. Kana & Katana is the manifestation of that opportunity to serve as shepherds, leaders, and teachers. In Japanese, Kana means writing and Katana means sword. The pen represents signal and knowledge, while the sword symbolizes action and change. When combined ethically and effectively, we believe these complementary concepts empower us to create the change we want to see in the world. In Kana and Katana you will find information about the crypto markets as well as the technology that enables them. Byzantine Fault Tolerant Distributed Ledger Technology has many uses - one of which has the potential to be used as global currency. Taking a step back though, DLT is a mechanism for securely and immutably storing value. Whether it be identity, ownership, digital rights, or money, this technology has the potential to disrupt and improve almost every industry in existence. In striving to be shepherds for this change, kanaandkatana.com will serve as our medium to provide education, insight and empowerment to the global community as DLT is used to rearchitect the foundational layers of value storage. We hope that the information provided through this blog is beneficial in understanding why we believe this technology will change the world while creating trillions of dollars worth of value along the way. To leave us comments or suggestions visit our contact page and to stay up to date as new content becomes available subscribe. 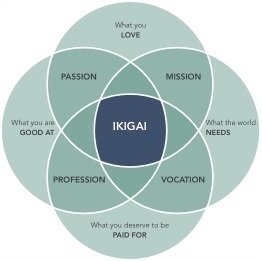 Ikigai is a Japanese concept that means "a reason for being." The word "ikigai" is usually used to indicate the source of value in one's life or the things that make one's life worthwhile. Crypto asset investing requires the application of public market investment techniques plus access to and understanding of venture-stage tech investing. This dynamic landscape demands active portfolio management and flexible investment strategies. Consistent alpha production from crypto asset investing requires dynamic tools to execute specific processes inside a well-defined investment framework. Ikigai has built a team of experienced investment professionals, entrepreneurs, engineers and data scientists. We seek to generate superior risk-adjusted returns through the execution of venture-stage pre-ICO investments and both systematic and fundamental liquid hedge fund strategies.